Training in Ayurvedic pulse diagnosis begins with self-pulse assessment – learning to evaluate your own pulse. Self-pulse assessment allows you to gain an initial experience of the patterns in your own pulse, as felt by three fingers placed along the radial artery in the wrist. 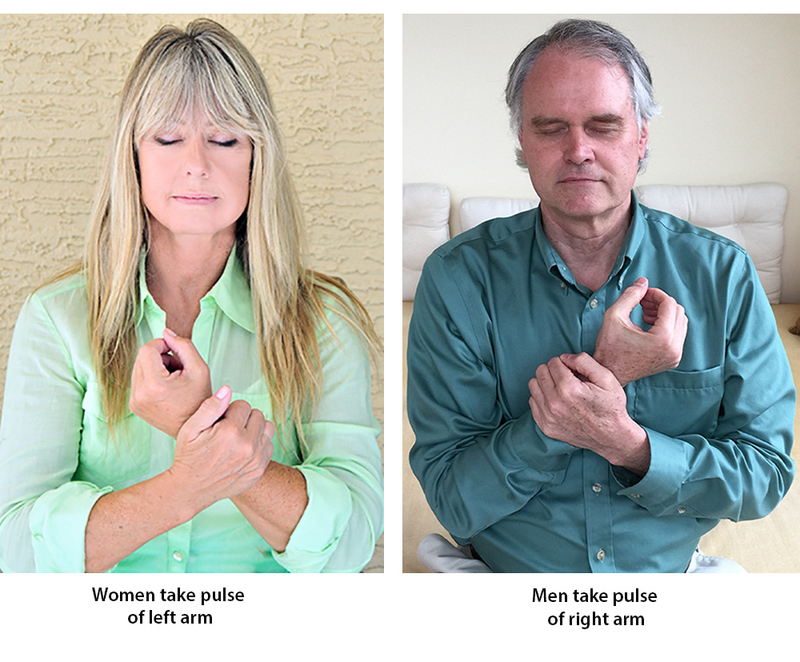 Men take the pulse in their right wrist and women take the pulse in their left wrist. This picture shows the procedure for men and women. Sit comfortably, place the three fingers on the pulse just below (proximal to) the radial styloid, the protrusion of the radial bone slightly below the wrist. Close your eyes and let your attention be with the flow of impulses into your three fingers. The position of the fingers on the pulse below the wrist is important. The upper finger goes on the top just below the bony protuberance below the wrist. The middle finger is placed just below it and the ring finger beneath that. The fingers are barely touching. 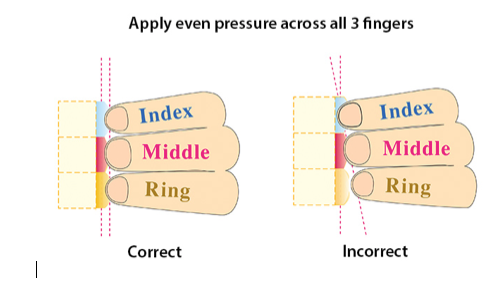 Press down gently with even pressure until you feel an impulse under at least one finger. Keep this level of pressure during the pulse taking. Once you have established this connection between the three fingers and the waves of the pulse beneath each of them then close your eyes. Let your attention easily be with the experience of the waves of the pulse rising into each finger. Even in your first experiences of Ayurvedic self-pulse assessment you may notice the impulses under one finger are stronger than the others. This indicates that dosha is most active at the time. In the Integrative Ayurveda Training Course for Health Professionals there are over 13 hours of pulse diagnosis training with detailed graphics. The faculty, Stuart Rothenberg, MD and Nancy Lonsdorf, MD, lead you through training in a thorough and easily learned manner. They are two of the most experienced Ayurvedic pulse diagnosis trainers in America, each with over 35 years of experience of clinical Ayurveda practice.